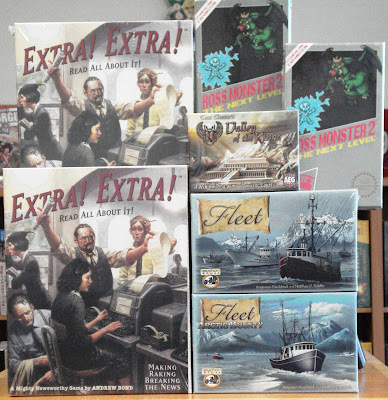 More new games have arrived! Brand new from Mayfair Games is Extra! 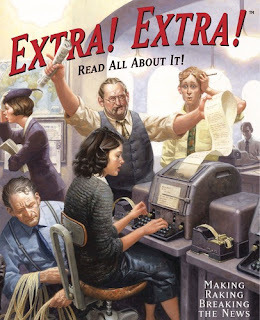 Extra!, a 2-6 player game where you enter the dog-eat-dog, man-bites-dog world of newspaper publishing. In Extra! Extra!, players are striving to fill the front, back, or center pages of their newspaper with Stories collected from the Editor's Desk. Each newspaper covers one news topic: business, politics, home, leisure, and sports. Stories are claimed by turning in a set of News cards that match the number of copy and photo icons on the story being claimed. To obtain the resources to claim stories, players must place their reporters on the 'News Desk' where bidding for those stories will be intense. Reporters can also conduct research in the morgue to make the stories easier to complete. Race to be the 1st to claim the headlines, interviews, and extras that will make your paper a success. At the end of the game, the winner is the player who has the most Circulation Points. 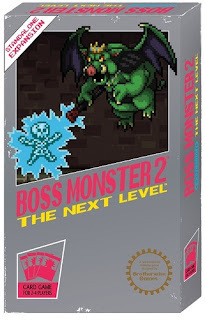 New in from Brotherwise Games is Boss Monster 2: The Next Level. This is a follow up game to the dungeon-building card game, Boss Monster where you become videogame-style villains, build deadly dungeons, lure adventurers, and destroy them. In Boss Monster 2: The Next Level you will take your dungeon to the next level. This all-new 160-card set plays as a standalone game or as an expansion to the original Boss Monster. Become one of 12 new Bosses, build powerful new Trap and Monster rooms, cast epic spells, and face new challenges with Hybrid Heroes and Dark Heroes.